The camp site has been set, the bonfire is ready, the car subwoofer is booming and everyone’ is ready to spend the weekend roughing it in the wild, having a good fun being one with nature. 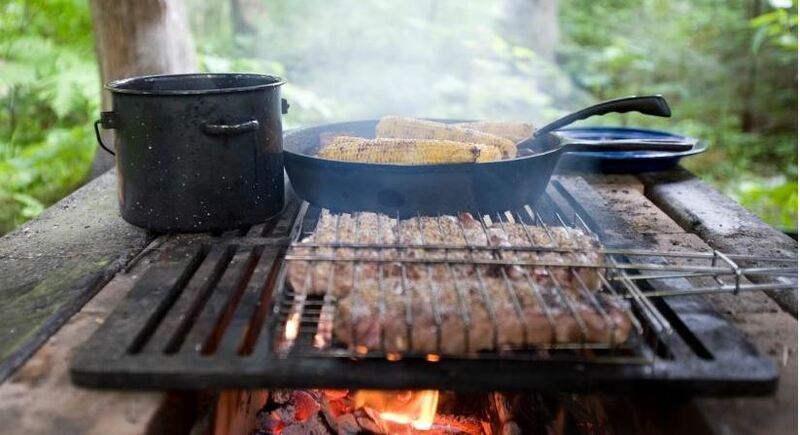 One of the most exciting things about camping is cooking over the open fire like our ancestors but while the idea is often romanticized and treated as something simple, campfire cooking isn’t as easy as it seems. Rest assured, however, that the following things will make things much easier! When it comes to camp cooking, where and how you make your campfire is crucial so keep this in mind. The very first thing you want to do is to make sure you’re starting a fire in the right place. Most camping areas will offer fire pits to minimize risks but if you can’t find one, simply look for a spot that’s free of grass, loose dirt and branches. Generally, avoid starting a fire anywhere near debris and things that might catch fire. This includes tree roots and branches, so no making a fire under a tree. Though it might not look like it, not all campfires are built the same. 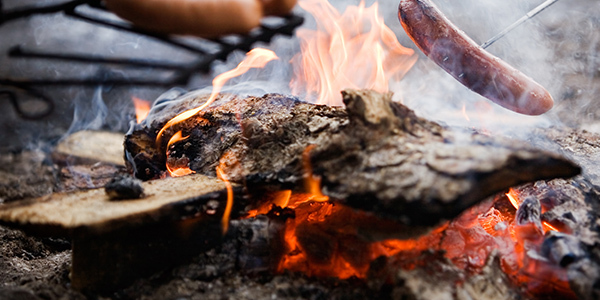 If you’re planning on using your campfire for cooking and cooking only, you should stick to a “hunter’s fire”, which you’ve probably seen on TV or movies before. This is the kind of fire that creates an inverted V shape, with thick pieces of wood surrounding tinder placed at the center. Think of a wooden teepee. A variation of this fire is to place two logs parallel to each other and start a fire in the middle. Hunter’s fire are so useful because they create a cooking platform and variable temperatures, which is a plus when you’re trying to cook. If you’re planning on using the camp fire for entertainment after cooking, stick to the traditional teepee shape and feed wood to the fire slowly to prevent it to get out of control. Remember to build it at a safe distance from the tents and keep flammable things, such as food wrappers and clothes, away from the fire. Choosing the right gear to cook is crucial for camp cooking. After all, this isn’t your kitchen so you’ll be lacking a lot of things and there won’t be second chances. Avoid using anything plastic, no matter how convenient, as plastic melts and one wrong move will can ruin your entire meal. For this exact reason you should avoid using pots, pans or any kind of utensils with plastic or rubber coated handles, as these too carry the risk of melting. Metal. That’s the material you want to use. There are cooking sets that have been created specifically to cook in a campfire. They’re lightweight, easy to carry and fire resistant but there’s no need to buy one unless you want. 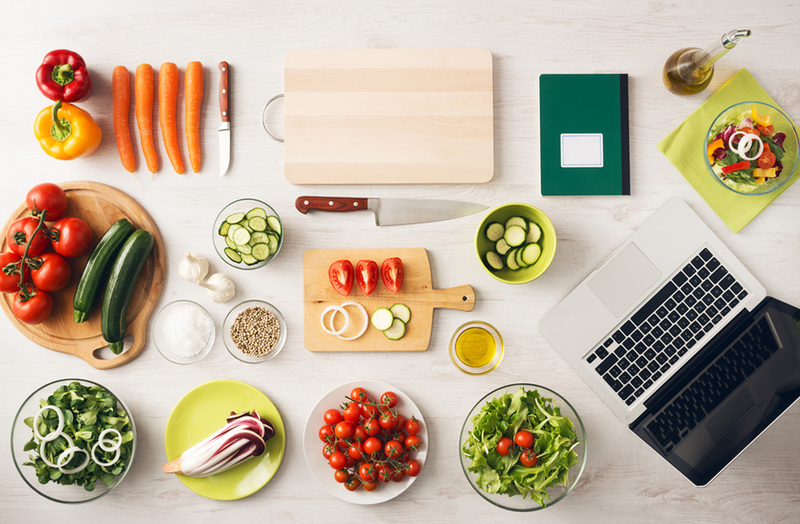 Just make sure there’s no plastic in your cooking tools and you’ll be good to go. 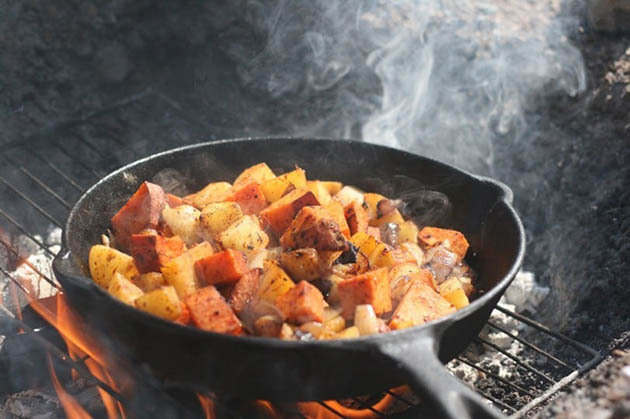 Cast iron skillets, for example, are a wonderful for campfires. Always use hand protection when cooking over a campfire. Leather gloves or other types of heavy duty gloves will do the trick. Just remember, avoid plastic! 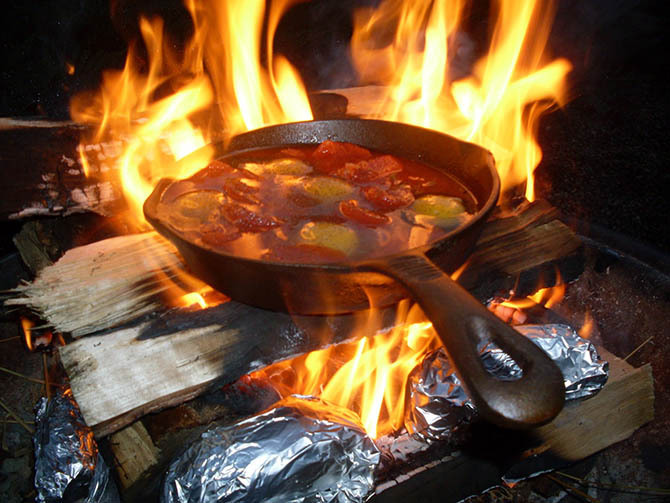 When it comes to cooking over a campfire, knowing what to cook and how to cook it is as important as knowing the right way to start a campfire. After all, not all foods are equal and some are more dangerous to cook outdoors than others. Bacon, duck and other greasy foods should better be avoided, no matter how delicious they are. You should also avoid food that needs to be fried and just about any kind of cooking oil. Grease and oil are highly flammable and you want to keep it as far away as possible from the heat. In a kitchen, where the fire is small, it’s rare for the grease to come in direct contact with it. This is not the case in campfires and even a small drop can cause a flare up that’s dangerous for everyone around the fire. Remember, camping often means no electricity and that means no fridge. Without a fridge to keep your food fresh for longer you need to be really careful not only with what you take with you but also how you store it and how you transport it. Keep your food tightly packed and iced, removing it from its packaging only when it’s time to use it. 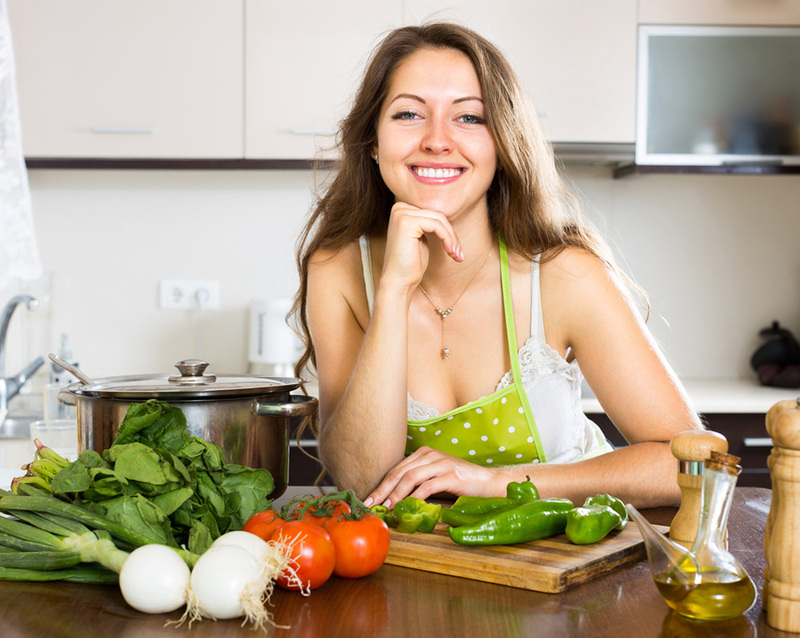 Leftovers should also be packed immediately and consumed as fast as possible to avoid any possible contamination. Campsites are amazing places and there’s a lot of fun to be had, but campfires are nowhere near as hygienic as your own kitchen so act accordingly. This one is pretty obvious. What you’re going to cook will change the entire setup of the campfire so know exactly what you’ll eat and prepare accordingly. You can go the easy hot dog and s’mores route, in which case you’ll only need sticks. You can also use a campfire ready grill in order to barbeque. You can even use a dutch oven, in order to cook delicious stews and even bake! - Always have a water bucket, sand or an extinguisher ear the fire. - Store food (both fresh and leftovers) in airtight containers and keep them away from your sleeping area. - Freeze food before putting it in the cooler. This will keep it fresh for longer. - If you want, you can freeze soups, broths and other liquids and thaw them out as needed. - Always carry two coolers. One for drinks and one for food. This will keep the food fresh for longer. - Heavy duty aluminum foil is your friend. Carry an extra just in case. - Never leave the campfire unattended. - Remember you can also cook over hot coals.